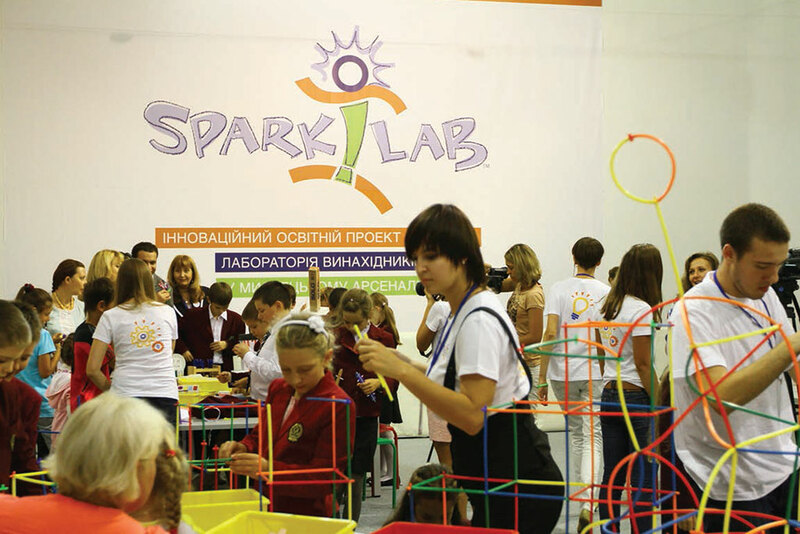 Ukrainian children learn by inventing at Spark!Lab, an installation from the Smithsonian’s Lemelson Center for Invention and Innovation. The September 2012 project, in cooperation with Kyiv’s Mysteskyi Arsenal Gallery, was supported by funding from the U.S. embassy. As I was hanging pictures in my office at the Smithsonian Institution at the beginning of my assignment there in 2011, a new colleague stopped by to welcome me. “Chiang Mai… Chiang Mai…” she pondered, as I placed photos from previous posts on the walls. “I think we have forest plots there.” And so I began to glimpse the extent of the Smithsonian Institution’s international reach, far beyond the familiar museums on the Mall. Today, thanks to the establishment of a State Department detail position at the Smithsonian in 2009, State bureaus and posts are able to take greater advantage of its international presence to reach foreign audiences. Whether pursuing conservation in Burma, building a Spark!Lab in Kyiv or bringing Hungarian musicians to the Folklife Festival, the Smithsonian’s international engagement complements the State Department’s work in education, culture, the environment and scientific cooperation. The sheer number of shared interests between State and the Smithsonian make the detail assignment I held an important investment for both sides. I was fascinated to find that the position I held for two years has historical roots. Marc Pachter, who later became director of the National Portrait Gallery, served as the Smithsonian liaison to the U.S. Information Agency in the 1980s. And in 2002, the Bureau of International Information Programs detailed Martin Manning to the National Portrait Gallery to work with Smithsonian Institution staff on the American Rooms Project, envisioned by then-Under Secretary for Public Diplomacy and Public Affairs Charlotte Beers as an interactive exhibit highlighting American themes. In my case, the detail provided lots of leeway, so I focused on helping State colleagues take advantage of Smithsonian resources for the benefit of overseas audiences. This mission set me on a path of discovery that ranged from jazz to mobile apps to wildlife conservation. From the Smithsonian side, I was regularly consulted on international issues, with my China experience proving especially welcome. 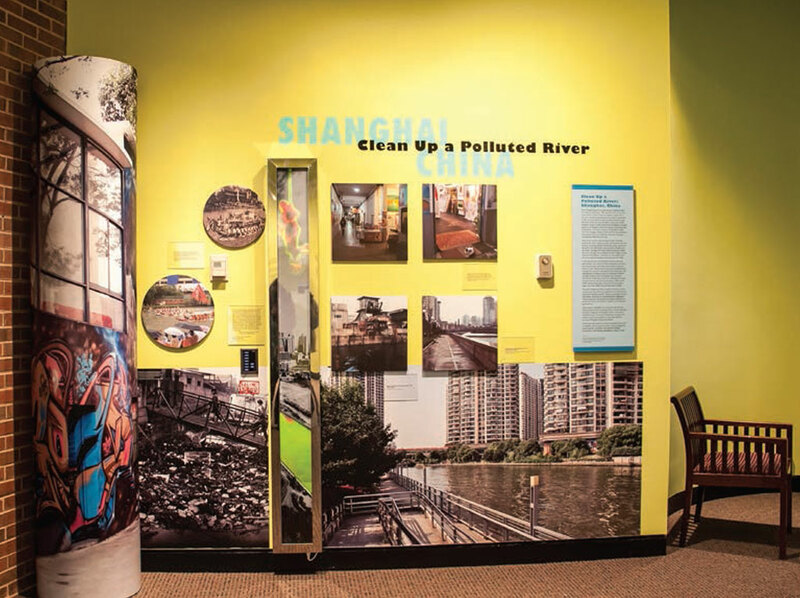 The U.S. consulate general in Shanghai assisted the Anacostia Community Museum in developing an exhibition called “Reclaiming the Edge: Urban Waterways and Civic Engagement.” It opened in October 2012. After the January 2010 earthquake in Haiti, the Smithsonian worked with the U.S. Agency for International Development, State’s Bureau of Educational and Cultural Affairs, and other partners to preserve the country’s rich cultural heritage, an important component of national identity and stability. With funding from ECA’s Cultural Heritage Center and the Department for Homeland Security, the Smithsonian hosts training for U.S. Immigration and Customs Enforcement officers to prevent illicit trafficking of cultural heritage items—expertise that has led to the return of antiquities to China, Egypt, Italy and other countries. The National Museum of American History’s Lemelson Center for Invention and Innovation worked with the U.S. embassy in Ukraine to install the first overseas Spark!Lab at Kyiv’s Art Arsenal Gallery. There, Ukrainian children learned about creative problem-solving by inventing such contraptions as gliders, gyroscopes and hydroponic gardens. The Smithsonian Jazz Masterworks Orchestra performs around the world, and the Jazz Appreciation Month program’s wealth of resources gives diplomatic missions celebrating International Jazz Day access to the Smithsonian’s trove of recordings, websites and activities. In a project with historical antecedents, Smithsonian staff members are helping the Bureau of International Information Programs reimagine and redesign model American Spaces, where foreign visitors can connect and learn about the United States. Drawing on the Smithsonian’s exhibit expertise and content riches, this collaboration echoes the institution’s earlier contributions to cultural diplomacy, introducing American life and institutions to foreign audiences. Projects like the Global Tiger Initiative and the Deep Reef Observation Project unite Smithsonian scientists with State Department personnel from OES and other bureaus. USIA provided funding to the Smithsonian for an international exchange program of art exhibits from 1965 to 1975, at which point the office handling these activities was transferred, along with three employees, into the Institution. In 1987, USIA worked with the National Portrait Gallery on an exhibit under the U.S.-China cultural-exchange agreement that was scheduled to tour Beijing, Shenyang, Nanyang and Chengdu; the agency contributed $190,000 toward the cost of mounting and transporting the works. After the Chinese government demanded that portraits of General Douglas MacArthur and Israeli Prime Minister Golda Meir be removed because of “their potential for offending the sensitivities of the Chinese people,” USIA cancelled the China tour; the exhibit went to Japan instead. “Smithsonian’s America,” featured in American Festival Japan ’94, showcased 250 items from the Smithsonian collections, including Thomas Edison’s light bulb, a Native American tepee, Dizzy Gillespie’s trumpet and the Apollo 14 space capsule. Although budget cutbacks at USIA put an end to major overseas exhibits, the Smithsonian Institution Traveling Exhibition Service continues to field requests from abroad. SITES’ first digital exhibit, “Green Revolution,” is on display in Mexico, while its “Elvis at 21” paper show will open in Canberra in December. 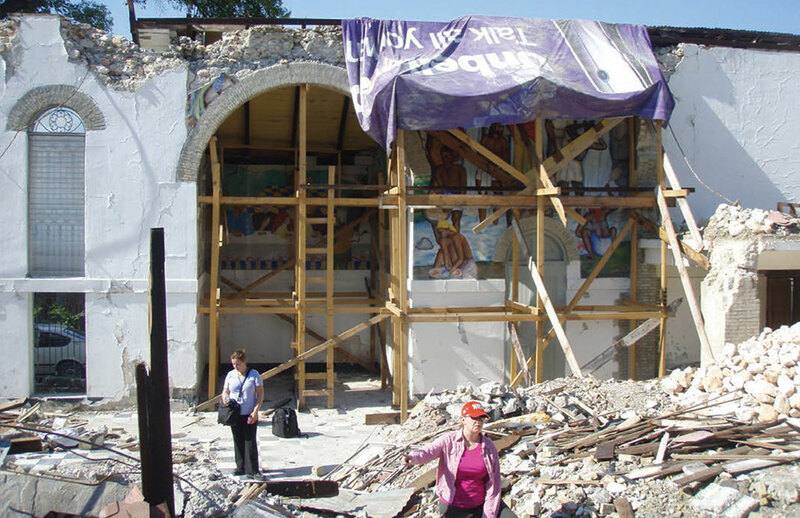 Restoring the wall murals at the Holy Trinity Episcopal Church in Port-au-Prince was part of a cultural recovery project organized by the Smithsonian after the devastating earthquake that struck Haiti in January 2010. Science and technology projects offer equally rich areas for cooperation, given the Smithsonian’s extensive international scientific involvement and the department’s pursuit of science diplomacy in more than 100 countries. The Smithsonian’s first sustained overseas operation, an observatory, started in Chile in 1918. Nearly a century later, in March 2012, Under Secretary for Science Eva Pell joined U.S. Ambassador to Chile Alejandro Wolff at the inaugural excavation blast at Las Campanas in the Atacama Desert, home of the future Giant Magellan Telescope. This 82-foot (24.5-meter) observatory is scanning the cosmos in unprecedented detail. Scientists from the Smithsonian Conservation Biology Institute use their expertise in ecology, forestry, global change science, wildlife and other disciplines in 25 countries, including Panama, Peru, Gabon, Namibia, Botswana, Thailand, Malaysia, Mongolia, China, India and Jamaica. SCBI also plays a key role in major conservation partnerships like the Global Tiger Initiative. The institute’s Gabon Biodiversity Program leverages a partnership with Shell Gabon to support biodiversity conservation and sustainable development, a model that is also being used in Peru and other biodiverse, resource-rich countries. The Smithsonian Institution has long been central to U.S. participation in international expos and world fairs, starting with the 1876 Centennial Exhibition in Philadelphia. Projects like the Global Tiger Initiative and the Deep Reef Observation Project unite Smithsonian scientists with the Bureau of Oceans and International Environmental and Scientific Affairs, while the National Zoo’s pandas are a matter of high-level diplomatic, as well as public, interest. Officers training for environment, science, technology and health positions take a behind-the-scenes tour of the Natural History museum to see how historic collections can illuminate modern-day questions related to climate change, biodiversity, conservation and public health. Kenya is another hot spot of past, current and future Smithsonian activity. Just three weeks after leaving the Oval Office in 1909, Theodore Roosevelt set out for British East Africa on an expedition co-sponsored by the Smithsonian. Many of the big-game specimens he bagged there were destined for the new U.S. National Museum building, today known as the National Museum of Natural History. Roosevelt’s expedition also collected live animals for the National Zoological Park, including a leopard, lions, cheetahs and gazelles. Kenya’s participation in the 2014 Folklife Festival in Washington, D.C., will give the Smithsonian a chance to showcase its long involvement with the country, from historic photos and specimens to Folkways recordings, National Zoo animals and planetarium shows. As for that forest plot in northern Thailand I mentioned at the beginning of this article, it turned out to be part of a global network of 48 locations researching tropical and temperate forests. By collecting consistent data over many years, scientists can make direct comparisons between sites. This is an unprecedented research program in climate and forest science that not only benefits conservation efforts, but builds long-term relationships whose value any diplomat can appreciate. I thoroughly enjoyed my time at the Smithsonian and the opportunity to work with colleagues dedicated to the increase and diffusion of knowledge. While Department of State details at other national institutions, such as the Library of Congress and the National Archives, have come and gone, the sheer number of shared interests between State and the Smithsonian make this position an important investment for both sides. Beatrice Camp, a Senior Foreign Service officer, was on detail from the Department of State to the Smithsonian Institution as senior adviser to the under secretary for history, art and culture from 2011 to 2013. Since joining the Foreign Service in 1983, she has served in Shanghai, Chiang Mai, Budapest, Stockholm, Bangkok, Beijing and Washington, D.C.